For the diffuse group rivaling against the Salvation Army, see Skeleton Army. 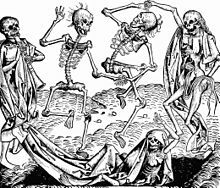 Animated skeletons in The Dance of Death (1493), a woodcut by Michael Wolgemut, from the Liber chronicarum by Hartmann Schedel. Animated human skeletons have been used as a personification of death in Western culture since the Middle Ages, a personification perhaps influenced by the valley of the dry bones in the Book of Ezekiel. The Grim Reaper is often depicted as a hooded skeleton holding a scythe (and occasionally an hourglass), which has been attributed to Hans Holbein the Younger (1538). Death as one of the biblical horsemen of the Apocalypse has been depicted as a skeleton riding a horse. The Triumph of Death is a 1562 painting by Pieter Bruegel the Elder depicting an army of skeletons raiding a town and slaughtering everyone. "The Boy Who Wanted the Willies" is a Brothers Grimm fairy tale in which a boy named Hans joins a circle of dancing skeletons. In Japanese folklore, Mekurabe are rolling skulls with eyeballs who menace Taira no Kiyomori. Figurines and images of skeletons doing routine things are common in Mexico's Day of the Dead celebration, where skulls symbolize life and their familiar circumstances invite levity. Highly-decorated sugar-shaped candy has become one the most recognizable elements of the celebrations. The moderns association between skeleton iconography and the Day of the Dead was inspired by La Calavera Catrina, a zinc etching created by Mexican cartoonist José Guadalupe Posada in the 1910s and published posthumously in 1930. Initially a satire of Mexican women who were ashamed of their indigenous origins and dressed imitating the French style, wearing heavy makeup to make their skin look whiter, it later became a more general symbol of vanity. During the 20th Century, the Catrina entrenched itself in the Mexican consciousness and became a national icon, often depicted in folk art. The animated skeleton features in some Gothic fiction. One early example is in the short story "Thurnley Abbey" (1908) by Perceval Landon, originally published in his collection Raw Edges. It is reprinted in many modern anthologies, such as The 2nd Fontana Book of Great Ghost Stories and The Penguin Book of Horror Stories. An anthropomorphic depiction of Death which looks like a skeleton in a black robe appears in almost all volumes of Terry Pratchett's fantasy series Discworld, including five novels where he is the lead character. Undead skeletons have been portrayed in fantasy films such as The 7th Voyage of Sinbad (1958), Army of Darkness (1992), The Nightmare Before Christmas (1993), and Corpse Bride (2005). An extended battle scene against an army of skeletal warriors was produced by animator Ray Harryhausen for Jason and the Argonauts (1963) and is remembered as one of the most sophisticated and influential visual effects sequence of its day. Animated skeletons have been used and portrayed extensively in fantasy role-playing games. 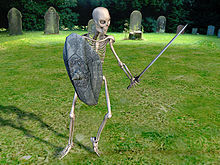 In a tradition that goes back to the pen-and-paper game Dungeons & Dragons, the basic animated skeleton is usually a low-level form of undead and considered suitable for use against novice players. They are commonly armed with medieval weapons and sometimes wear armor, while the more high-level variants can cast spell and even communicate. In the 1999 cult classic Planescape: Torment, Morte is a character who joins the protagonist on his quest and is essentially a sentient, levitating human skull with intact eyeballs who cracks wise and fights by biting. In the PlayStation action-adventure series MediEvil, the protagonist is an animated skeleton knight named Sir Daniel Fortesque. Following a poll taken during their Kickstarter campaign, Larian Studios added a playable skeleton race in their 2017 RPG Divinity: Original Sin II, as well as an ancient skeletal character named Fane. A duo of animated skeleton brothers play an important role in the computer role-playing game Undertale. They are named Sans and Papyrus and speak in Comic Sans and Papyrus fonts, respectively. ^ Paffenroth, Kim; Morehead, John W. (2012). ""Can These Bones Live Again? ": Theological Considerations of the Zombie Walk". The Undead and Theology. Eugene, OR: Wipf and Stock Publishers. pp. 112–120. ISBN 9781610978750. ^ "Dancing with Death: The origins and development of the Dance of Death motif and its representation in graphic art". University of Glasgow Library. Retrieved 2018-12-29. ^ V., Andrey (8 June 2018). "The Triumphant Return of The Triumph of Death - Pieter Bruegel the Elder Restored at Museo del Prado". Widewalls. Retrieved 2018-12-29. ^ "Mekurabe – Yokai.com". Retrieved 2018-12-29. ^ Chef, Katelyn (1 November 2016). "A Sweet History of Sugar Skulls on Day of the Dead". Martha Stewart. Retrieved 2018-12-29. ^ "History of Day of the Dead & the Mexican Sugar Skull Tradition". MexicanSugarSkull.com. Retrieved 2018-12-29. ^ Widyolar, Keith (4 November 2018). "Catrina La Calavera Garbancera is the icon of the Day of the Dead". New York Latin Culture Magazine. Retrieved 29 December 2018. ^ "La Catrina". Copal, Mexican Folk Art at its best Online. Retrieved 2018-12-29. ^ Leeder, Murray (2017). The Modern Supernatural and the Beginnings of Cinema. Calgary, AB: Palgrave Macmillan. p. 149. ISBN 9781137583710. ^ "Thousands ask Death to give Terry Pratchett back". The Independent. 2015-03-13. Retrieved 2018-12-29. ^ Clark, Nick (8 May 2013). "Ray Harryhausen, the visual effects master famed for skeleton battle in Jason and the Argonauts, dies aged 92". The Independent. Retrieved 2018-12-29. ^ "Skeletons (Concept)". Giant Bomb. Retrieved 2018-12-29. ^ "Skeletal Mage". D&D Beyond. Retrieved 2018-12-29. ^ "Morte (Character)". Giant Bomb. Retrieved 2018-12-29. ^ "Sir Daniel returns in 4K in MediEvil Remaster for PlayStation 4". VG247. 2017-12-09. Retrieved 2018-12-29. ^ Kelly, Andy (2017-09-26). "The joys of being dead in Divinity: Original Sin 2". PC Gamer. Retrieved 2018-12-29. ^ Schilling, Chris (2018-05-05). "The making of Undertale". PC Gamer. Retrieved 2018-12-29.